Which forces logo would you like engraved? This pine cribbage board is 15 inches in diameter and over an inch thick. It hangs on the wall when not in use and comes with a hanging hole pre-drilled at the top of the back of the board. This board is designed to make play easy for those with limited vision or trouble grasping and moving pegs. 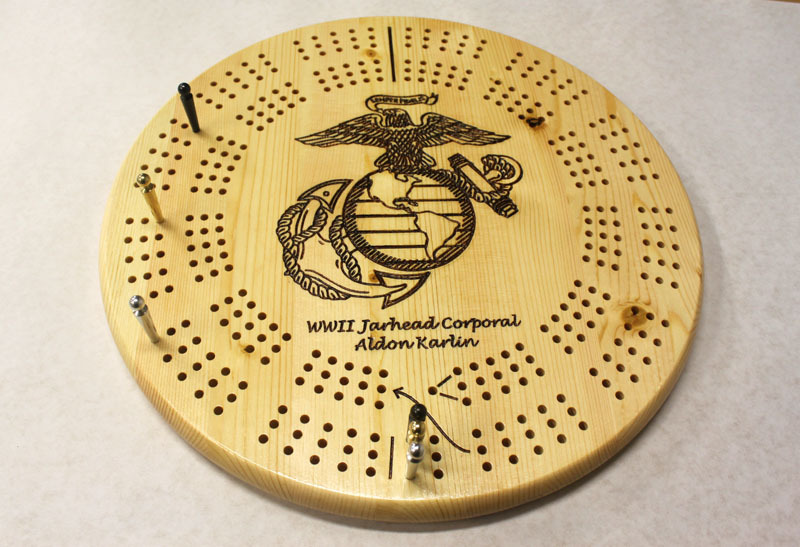 Each hole is 3/16" in diameter, and the board comes with six giant-sized 2" long metal pegs. They live in a pocket in the back of the board, secured by a sliding brass plate. This way, you'll never forget where you put your pegs! The board face features three spiral tracks and an engraved center area featuring a selection of U.S. Forces logos. The engraving is filled with a deep brown acrylic paint to highlight it. After sanding smooth, this board is finished with layers of shellac for protection.